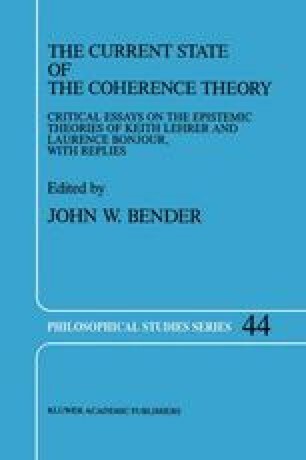 In evaluating any coherence theory, we must answer two classic questions: (A) What is coherence ? and (B) Can there be several internally coherent but mutually incompatible systems of belief? Given a plausible answer to (A), the answer to (B) must be “Yes.” This dooms any coherence theory of truth. For trivially, there cannot be two incompatible systems of true beliefs. But a “Yes” answer to (B) is a point in favor of coherence theories of justification. For a justified belief need not be true, and it is quite possible for two individuals with incompatible beliefs to both be fully justified in their beliefs. Note that a coherence theory of justification would not entail that there may be incompatible systems of knowledge. For knowledge requires true as well as justified belief. Given two individuals with incompatible but fully justified beliefs, at most one can have knowledge.